Yakushima is an island located in the south of Osumi Peninsula in Kagoshima prefecture and its area covers about 500 km2. Mt. Miyanoura located at its center is the highest peak of Kyushu region. Being one of the rainiest zones in Japan, the mountainside is covered with a primeval forest of Yaku cedars. Included in Kirishima Yaku National Park, it has developed recently as a tourist resort. There is a regular flight line from Kagoshima. Mt. Miyanoura, towering in Yaku Island of Kagoshima prefecture with 1935m above the sea level, is the highest peak of Kyushu region. Called Yaku-okudake along with other peaks such as Mt. 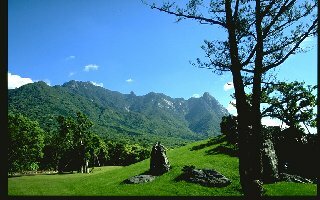 Nagata (1886m), it is composed of granite and frequented by deer and monkeys. The primeval forest of Yaku cedars on the mountainside is declared as a special natural monument. You can climb there from Anbo on the east coast. Being a small island located in the middle of Kuroshio Current with high mountains, it has a warm and rainy climate. Moreover, being an island separated from the mainland, the forestry has not developed. For those reasons, from 1000m to 1500m above sea level, the island is covered with a primeval forest of Yaku cedars. The cedar with an estimated age of 7200 years and called Jomon-sugi, that is the cedar living since Jomon period, is impressive. Tanegashima is a long island stretched along north-south direction and located in the north-est of Yaku Island. The area is about 450 km2. Formed of flat sea erosion terraces, its highest point is 282m. It is well known that Portuguese have brought for the first time guns into Japan in 1543 at that place. Now it has become a base to launch satellites.